author Hodder, Philip J. C.; Nemec, James M.; Richer, Harvey B.; Fahlman, Gregory G.
Messier 71 (also known as M71 or NGC 6838) is a globular cluster in the constellation Sagitta. It was discovered by Philippe Loys de Cheseaux in 1746 and included by Charles Messier in his catalog of comet-like objects in 1780. It was also noted by Koehler at Dresden around 1775. M71 is at a distance of about 12,000 light years away from Earth and spans some 27 light years across. The irregular variable star Z Sagittae is a member of this cluster. 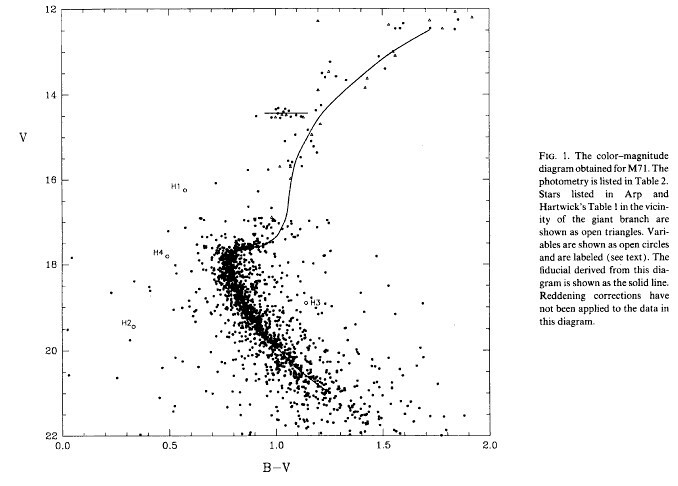 M71 was long thought (until the 1970s) to be a densely packed open cluster and was classified as such by leading astronomers in the field of star cluster research due to its lacking a dense central compression (..) However, modern photometric photometry has detected a short "horizontal branch" in the H-R diagram of M71, which is characteristic of a globular cluster. Grundahl, F.; Stetson, P. B.; Andersen, M. I.
Hodder, Philip J. C.; Nemec, James M.; Richer, Harvey B.; Fahlman, Gregory G.